As homeowners we all know how frustrating it can be when we fall prey to plumbing clogs of any type. From sink drains and toilets, to showers and even garbage disposals, the type of plumbing problems that occur are many. With that said, often times homeowners will attempt to resolve their plumbing issues and more times than not with a plumbing snake. The folks here at Steve Mull Plumbing want to take some time to familiarize our clients with the various types of plumbing snakes that are available and how they actually work. For starters the simplest of all snakes is that of a coiled metal cable that is equipped with a hand crank which is used to navigate the clogged area. This snake is used when a simple plunger will not work. It is designed to shimmy its way down into your sink or bathtub drains to locate the actual clog that is causing you all the frustration and grief. Quite easy to use and most times effective, this plumbing snake, sometimes referred to as a toilet jack, is not only popular but every bit affordable as well. Certainly, a must have for any homeowners, these snakes are typically available in all types of home improvement stores. Next, is the toilet auger. It has a slightly different design that is specific to the odd shapes of most toilets. The toilet auger is constructed with a flexible, long shaft made of metal and has an auger bit attached at one end and a crank handle located on the other end of the shaft. It bends quite substantially which makes it quick and easy to fit through the hole in the bottom of your toilet bowl. It easily maneuvers through your toilet drain and is able to remove obstructions of nearly every kind. When using an auger simply push the cable through your toilet drain and crank the handle clockwise until it stops. Then push the cable forward and allow the auger bit to grab onto the material causing the clog and break it up. Once the clog has been cleared gently pull the cable out of the drain. Finally, there is a mini-rooter which is an electric plumbing snake that extends near to 75 feet long and is equipped with a variety of attachments that allow you to cut through all types of clogs. This handy machine can clear lines in your kitchen, bath and laundry room with ease. It is fairly inexpensive and quick and easy to use and is designed with an air foot switch, a safety slip clutch, an inner drum and distributor tube spring that helps prevent tangling and even a ground fault circuit interrupter for safety. The team here at Steve Mull Plumbing wants to remind all our clients that if you choose the DIY route for handling of your home plumbing problems, then be prepared to handle not only the clog but the mess that comes along with it. Be sure to prepare your plumbing site in advance with plenty of rags or cloths so as to avoid any excessive accumulation of water in the area. Also, if you find you are not up to the task, then don’t delay in reaching out to our friendly professional plumbers for all your plumbing clogs and needs. 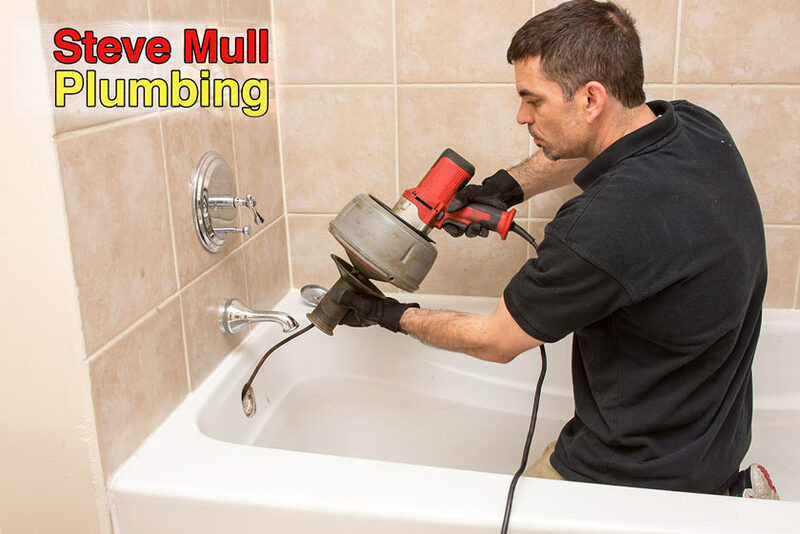 If you are in need of a professional plumber then surely you have come to the right place. Whether you have a clog, require new installation, are in need of a plumbing snake or plumbing repairs, we are the team for you. There is no project too big or too small for our professionals. Simply give a shout out to our staff and schedule your appointment today. We look forward to serving you and to providing you with the best all round plumbing products and services this side of Tennessee. Don’t put off handling your plumbing clogs. Contact our team today! !